Fig 2 is a thin slice out of Fig 1. Vacuum chamber The chamber is a torus (Sketch A) that wraps about the center post. 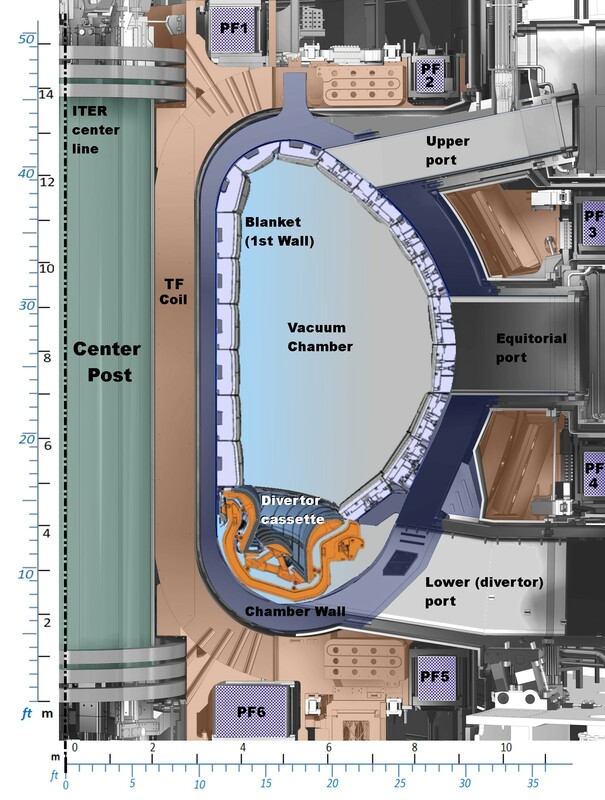 Between plasma pulses, the chamber maintains a deeper vacuum than that in Earth orbit. The chamber wall structure holds the cooling lines to keep the walls from melting during each fusion pulse. A tokamak is a huge, high power transformer. The facility powers the primary coil which drives very high current in the ionized gas “secondary coil” – the plasma. The induced current starts heating the plasma to fusion temperatures. 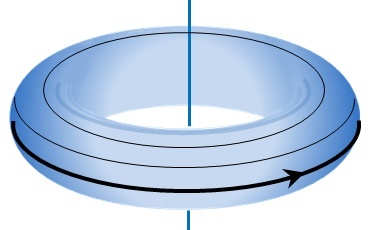 Toroidal field The TF coils (Fig 2) generate a strong magnetic field in the toroidal direction (Sketch B). 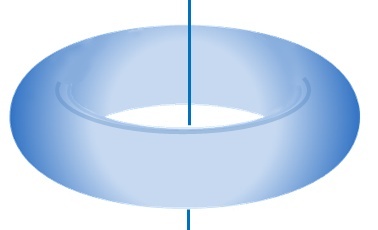 Since the current is in a coil is always perpendicular to its generated magnetic field, the toroidal field coils must wrap about the chamber in the poloidal direction (Sketch C). 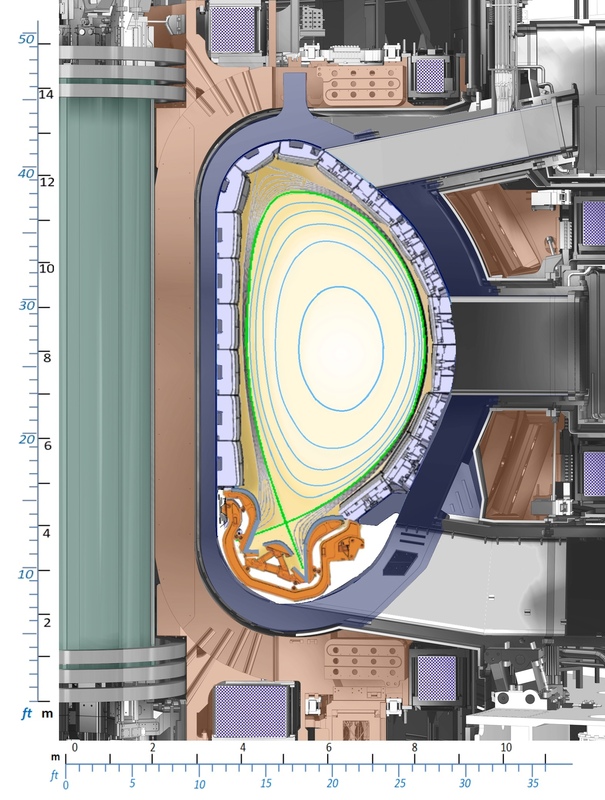 The TF field is the first part of a tokamak’s confinement strategy. Poloidal field A poloidal magnetic field loops about the chamber in the direction shown in Sketch C – meaning each of the 6 PF coils form toroidal rings about the center post. 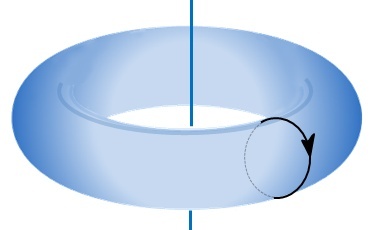 These coils shape the plasma to provide a second method for confinement and stability. Note: Tokamak confinement is not the topic for this post. Center post This prevents the TF coils from twisting due to the magnetic forces. Its outer cover houses the stack of 6 huge ring-shaped primary transformer coils (“center solenoids”) that drive the plasma current necessary for confinement and the initial boost in heating the plasma. Fig 3 is similar to Fig 2, but shows the confined fusion-hot plasma. Inside the hot core, the field lines are not random but lie on closed shells (called flux shells), the nested egg-shaped circles shown. Each magnetic field line is mostly in the toroidal direction, but corkscrews around its flux shell as it moves about the center post. Since plasma ions and electrons follow a field line, they are confined to the fusion region. Tokamaks became famous when the Russians showed (1968) that this really does work, does confine hot plasma. The flux shell painted green in Fig 3 (the separatrix) separates the confined central plasma from cooler plasma that runs directly into the wall. Always find the separatrix from its distinctive the × point. The plasma in the fusing core is at about 150 million degrees C. This is hotter than any welding/cutting torch on Earth, and is actually much hotter than the sun. Without good confinement, the plasma might start to heat up, but could roar through the vacuum walls with unstoppable fury. ITER would destroy itself before it even got started. Divertor Cartridge Here is what always happens: plasma heats in the confinement region to fusion temperatures and each hot electron and ion will slowly diffuse out of the core until it reaches the separatrix shell. Some of this outer plasma diffuses into the chamber walls. The plasma is still fierce enough to erode the first surface. Tests on smaller tokamaks have seen wall materials that have diffused back into central plasma, and poison the fusion reactions. 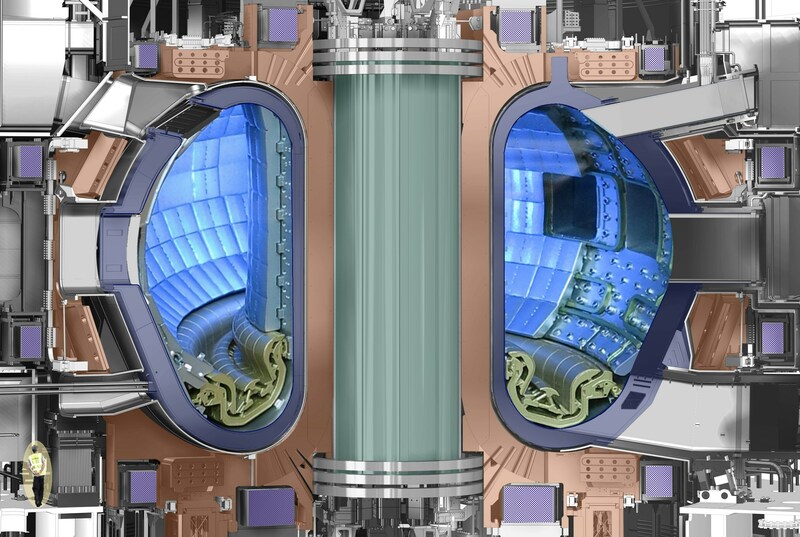 ITER’s first wall is a beryllium alloy, a material that causes minimal plasma poisoning. Most of this outermost plasma will rapidly flow directly to the × point where it will flee confinement and will smash into solid material there. Restate – in a fusing plasma, the × point transmits extraordinarily high power onto material walls. 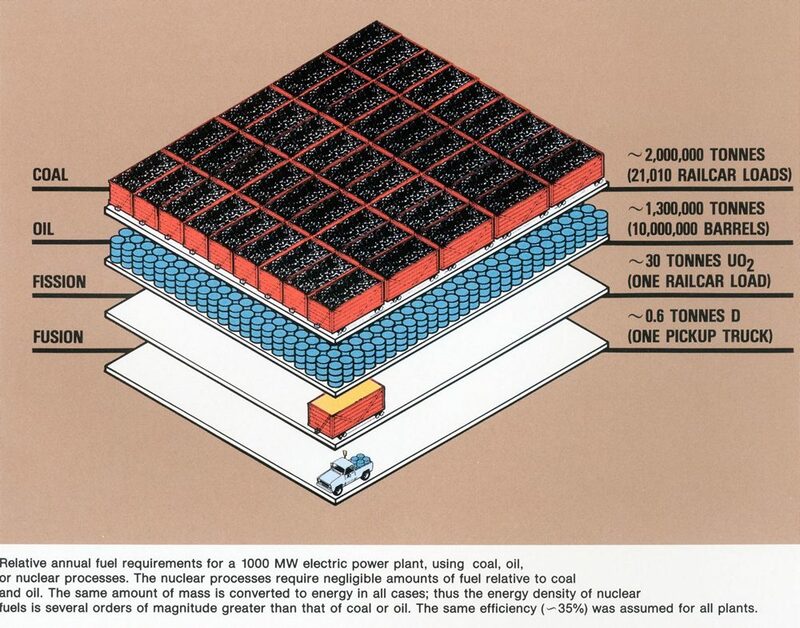 This is called the waste heat or waste power issue. Fig 4 show a divertor cassette that forms the target for the × point exhaust. It is made up of a tungsten (W) alloy on its front “target” surfaces where the plasma strikes. The divertor cassettes have huge ducts to direct the exhaust into high flow vacuum pumps, and significant cooling through out. Yet the front surfaces will erode due to the intense plasma attack. The divertors will require frequent replacement. Why so long a wait? 1958-1968 Most labs worked with one of 4 machine types:, mirrors, stellarators, linear pinches and toroidal pinches. None had success lasting longer than microseconds. 1973 Richard Nixon and Leonard Brezhnev discussed an international cooperation for the very first time, although both countries had active fusion experiment laboratories. 1978-1987 The Nixon/Brezhnev meeting led to the formation of the INTOR (international tokamak reactor) study group. INTOR generated engineering reference diagrams, but no true facility design. In 1981, the U.S. began defunding fusion research in its homeland. 1987 The USA, Euratom, Japan and the USSR signed the ITER collaboration documents. 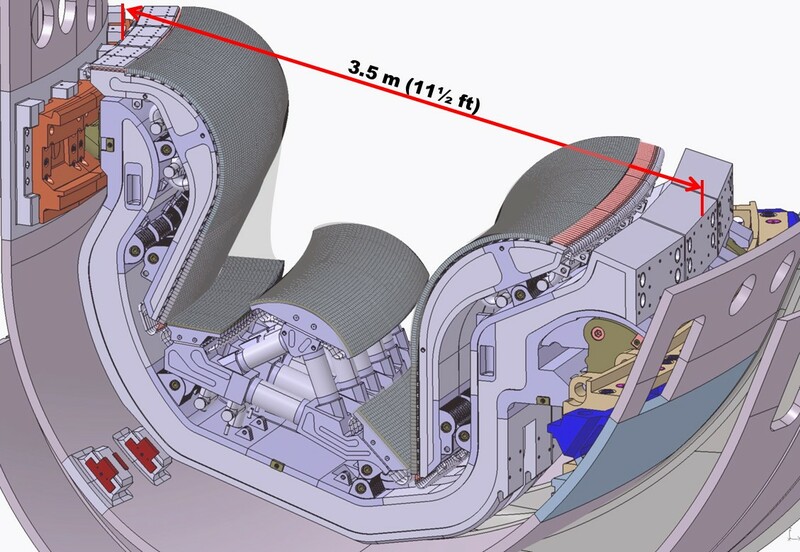 Work started in 1988 on the conceptual design, mostly updates on the INTOR reference design. 2006 The ITER agreement was signed, although it was not actually ratified until 2007, 10 years ago. 2010 ITER facility groundbreaking ceremony (7 years ago). 2015 (December) First machine component delivered. If you have only been exposed to the negative meme “Fusion is always 20 years away” choose your time to start. If you chose 1945, why not, instead, 1913, when the Bohr atomic model was developed? If this had been started in 1981 in just the USA or just Europe, or Japan or Russia it would have been up and running – in half the time and almost certainly at half the price. Someone referred to a camel as a horse designed by a committee. Well, ITER is a fusion fusion experiment designed by a committee of people from squabbling countries all around the world. The process has also been called wanting a fusion machine in the worst possible way – and doing it that way. Between 1988 and 2010 it was a political game and engineering nightmare, everywhere. Why? Fig 5 is a single graphic General Atomics has used for 45 years. 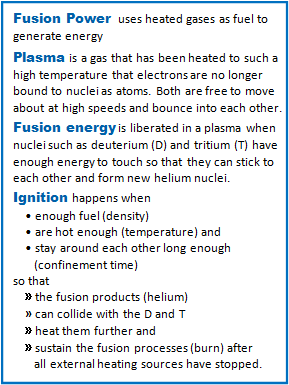 Ans: You get more energy per gram of fuel from fusion than any other method. This entry was posted in Technology and tagged Fusion Reactor, Fusion Timeline, Ignition, ITER, Tokamak Divertor. Bookmark the permalink.